Alexa Efraimson came to Bydgoszcz, Poland, on a mission. "I really want to medal," she said after running a smooth 4:13.12 in the 1500m prelims this morning at the IAAF World U20 Championships. American junior women have placed fourth in the 1500m at this event three times, but none have ever medaled. Elise Cranny was fourth at the 2014 championships in Eugene, Oregon; Jordan Hasay placed fourth in both 2008 in Bydgoszcz and 2010 in Moncton, Canada. The 19-year-old Nike professional placed sixth in the U.S. Olympic Trials two weeks ago in 4:07.34, and she was in the mix as the final Rio qualifier, Brenda Martinez, clocked 4:06.16 for third. "[Poland] was the goal all season," Efraimson said this morning in Bydgoszcz. "The Olympic Trials were really good stimulation in terms of rounds and competition level, so I think this will be relatively equivalent. I learned a lot from all three of those races, so hopefully I can bring that knowledge and experience here." The Camas, Washington, native also brings past U20 experience to the table. As a 17-year-old, she made the final at the 2014 event--then called the IAAF World Junior Championships--in Eugene, along with Elise Cranny, who now runs for Stanford. That year, Efraimson placed sixth in 4:13.31, while Cranny was fourth in 4:12.82. Several other competitors from 2014 are also returning: Winfred Mbithe of Kenya, who placed seventh in 2014 and finished just ahead of Efraimson in the prelim today; and Bobby Clay of Great Britain, who was eighth in 2014 and placed fourth in today's prelim. 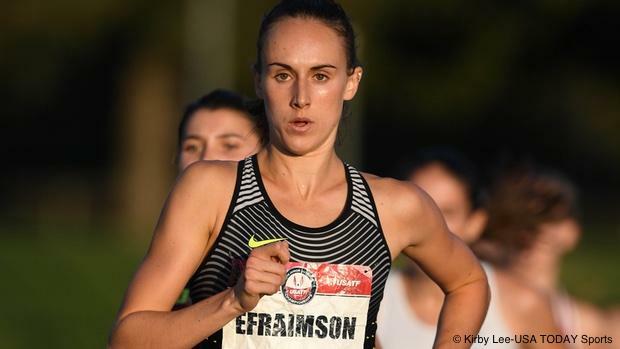 Five athletes in the field own PBs under 4:10, and Efraimson is the fastest at 4:03.39, which she ran at the Pre Classic last year. Is she ready to run that fast again? "I feel like I'm in the best shape of my life," she said. The other top contenders are Ethiopian duo Fantu Worku and Adanech Anbesa, who have both run 4:05; Beatha Nishimwe of Rwanda, whose PB is 4:08.75; and fellow American Christina Aragon, who ran 4:09.27 in June and also competed at the Olympic Trials. "She ran great," Efraimson said of her teammate. "Maybe we'll both medal." Aragon looked strong in the qualifying round as she navigated from the back of the pack to fourth--the last auto-qualifier spot--by the bell lap, and clocked a final time of 4:18.93. "I tried to mentally prepare myself," Aragon said after a race of aggressive positioning and jostling elbows. "You might not always be in a position where you're comfortable, but you just have to be patient and wait, and the place where you're supposed to go will come eventually. I just try to keep myself calm." Aragon's experience at the Olympic Trials culminated with the third-fastest time of her career, 4:12.71, for ninth place in the semifinal--just one spot away from making the last round. "You have to have confidence to go out there," she said, "and even if you're running with girls you aren't completely sure you can hang with, you have to--in your own mind--say, 'You can; you can run faster than you ever have.' You don't have to set limits on yourself, you just have to take it as an opportunity." The biggest opportunity to date for both athletes will take place this Sunday at 4:45 p.m. in Poland.